I believe I have mentioned this before, whenever it’s one of my nieces or nephews birthdays, they get to pick what kind of cookie I make and mail to them. Pretty lucky, huh?! Well one of my nieces doesn’t like chocolate… I know, I don’t understand – I live off chocolate. So I was giving her a few options of cookies I could make and one of the options was maraschino cherry cookies. I got to work and made five test batches! Some of the batches were pretty funny looking – working with an add in like maraschino cherries can be hard because they have so much moisture. But I finally got the recipe just right! 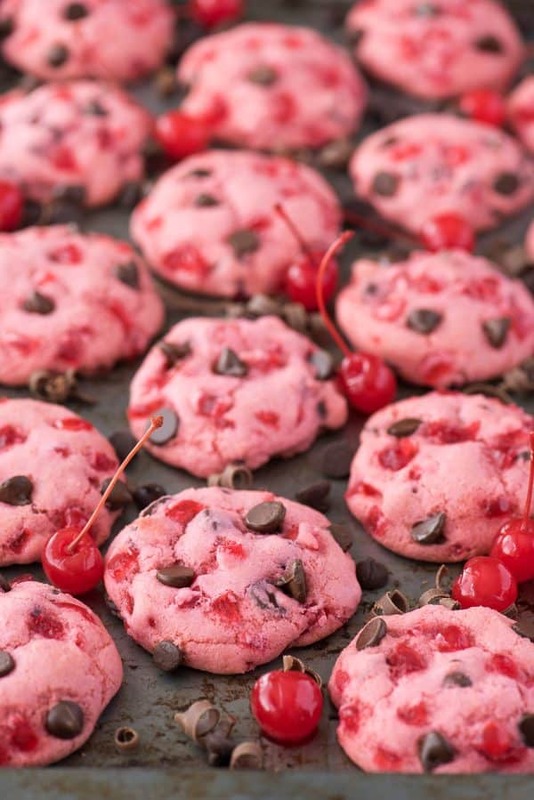 The ones I mailed her didn’t have chocolate chips so you can definitely make these cherry cookies without the chips, but for us chocolate lovers, more chocolate the better! 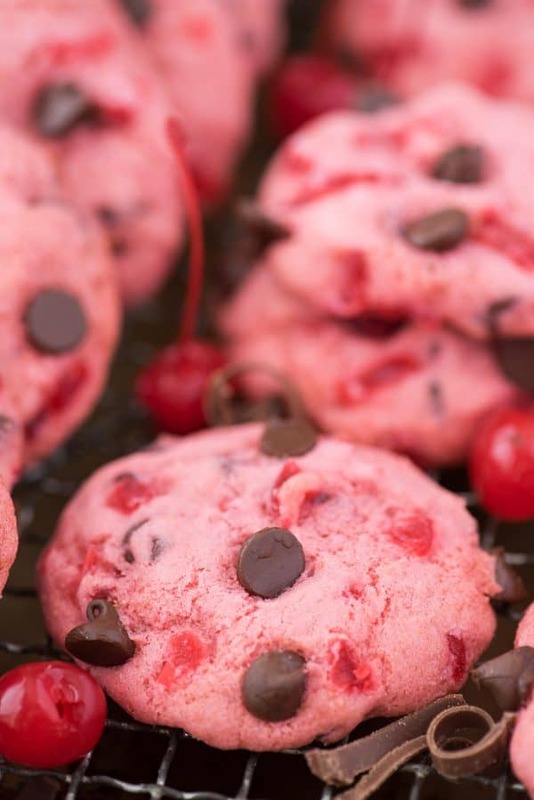 I’d bet these maraschino cookies would also be really good with white chocolate chips! -You need 3/4 cup chopped & drained maraschino cherries. Plus an extra 2 tablespoons or so for garnish. 3/4 cup chopped maraschino cherries is about half a 16 oz jar. -Be sure to drain the cherries well. Once you drained off the juice, put the cherries on a few napkins and let the extra juice soak up. -Once the cherries have been drained, finely chop them. 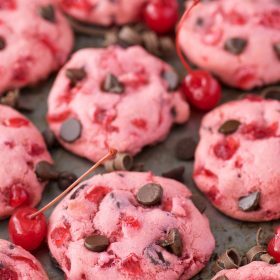 -If you want the tops of your cookies to look loaded with cherries & chocolate chips like the ones you see in the photos, be sure to add additional cherries and chocolate chips to the outside of the dough balls before baking the cookies. -The recipe yields about 20 cookies. In a mixing bowl beat the butter and brown sugar with an electric mixer for 1 minute, or until combined. Add in the egg and extracts, beat again. Add in a small amount of pink gel food coloring and mix. In separate small bowl, whisk together the flour, baking soda, and salt. Gradually add the dry ingredients to wet ingredients, mixing by hand with a spatula. Add in the finely chopped maraschino cherries and chocolate chips, mix by hand until combined. The batter will be thick. 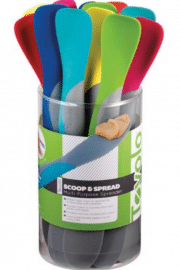 Use a cookie scoop to drop dough balls onto a silicone lined baking sheet. 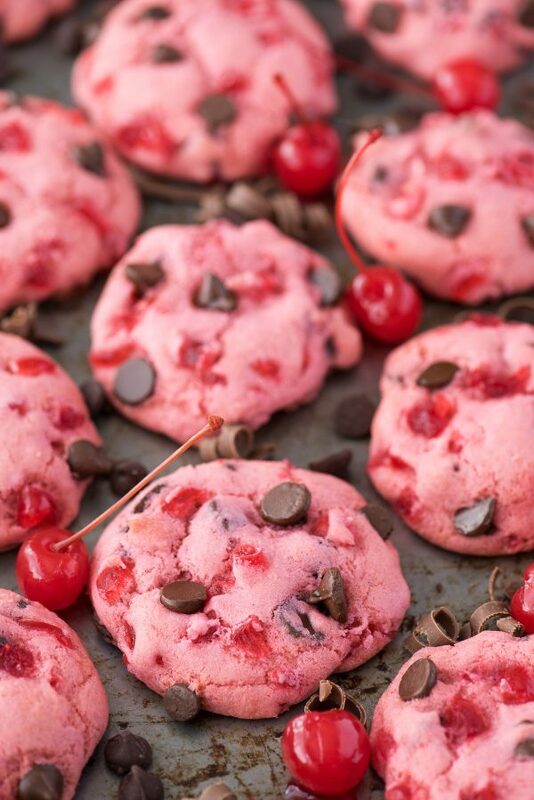 Press additional cherries and chocolate chips into the outside of the dough balls. 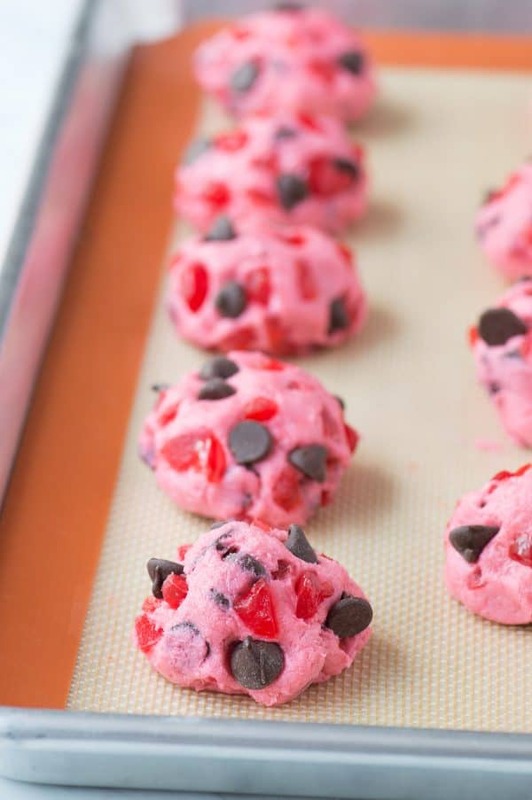 Bake for 14-16 minutes - be sure not to over bake or the cookies will loose their pink color and turn brown. 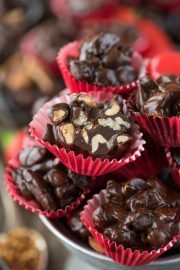 chocolate and cherries! Could there be anything so delicious!?????! I think not! 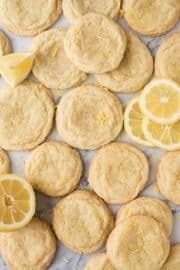 In love with this recipe and judging from your photos the cookies just look so appealing! Lovely cookies that I cannot wait to bake and eat! Please make an option to email the recipes. I know lots of people who would appreciate that. Hi Pam! I have an e-mail that goes out once a week updating my subscribers with the most recent recipes! Would you like me to add you? Hi Roni! 1/2 stick is correct – this recipe only yields 20 cookies, so it’s not as large as a normal batch. Delicious!! They came out very nice looking! Do you have anything with splenda?? I’m so glad you enjoyed them Veronica! I don’t currently have any recipes with splenda. Look for Swerve Sugar substitutes. They are usually carried by health food stores, and if they don’t, they will probably be glad to order some for their store. It truly has no aftertaste, and is used in the same amounts as sugar. I use all three forms, that they make, in my recipes for my diabetic clients – granulated, brown, and confectioners’. I just started using Swerve recently, and my clients are thrilled that when someone tastes their cakes, made with Swerve, their non-diabetic friends can’t taste the difference. It’s a little on the expensive side, but for someone who can’t have sugar, it’s more than worth it for their enjoyment. Could this be made without almond extract? Does it need a replacement? I’m guessing it is find if you don’t have gel food colouring, too, as it just won’t look as bright. It’s just for flavor – you can substitute vanilla extract! Can you use candied instead of maraschino cherries? Thank you for this recipe. My Daughter is in love. Hi Cille! I would say yes – let me know if you try it and report back! We don’t have Publix here, but that ice cream sounds quite delicious! Found this on Facebook and had to make it! I had a 4yr old help me, so I messed up the order of things. (I should have know better to add dry ingredients together first!) So, this recipe is fool proof! lol I didn’t have almond extract on hand so I added a little more vanilla. I also only had liquid food coloring and used that. While the pink wasn’t as bright, it worked. I wished I reserved some cherry juice to add to batter. I think that would have made the cookie taste even better! Also, because I messed up the steps, my dough was dry. I had to add some water. For someone who doesn’t like cherries that much, I give this recipe a 5 star! Thanks for sharing! Hi Mary!! I’m so glad you guys enjoyed making and eating these cookies! 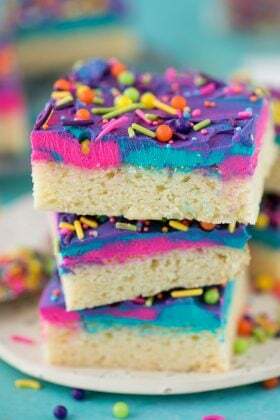 Is it possible to make these without the pink gel food coloring? I don’t mind the looks of the cookies more focused on the taste. Hi Bradley! Definitely – it’s just for aesthetics! Hi Diane! You can omit the chocolate chips – I did that when I sent these to my niece who doesn’t like chocolate. And yes, you can use a baking sheet lined with parchment paper! Is the almond extract necessary.? Hi Landa! It’s just for flavor – you can substitute vanilla extract! Hello, these look delicious. I want to put them in my Christmas goody bags this year. Have you tried freezing them? Thank you! Hi Kristen! I haven’t tried freezing these cookies. Sounds like a great cookie to put in goody bags! Why do u not add all of chocolate chip and cherries save time just add all to mixture I even like a few walnuts in mine. Hi Diane! I like putting extra garnishes on the outside of my cookie dough balls so they look extra yummy! Is it light or brown sugar? I have a variety in my pantry – so use whatever you have! When I write a recipe, brown sugar means light, and if it calls for dark, I add the word dark. If you don’t have brown sugar on hand, it’s easy to make. 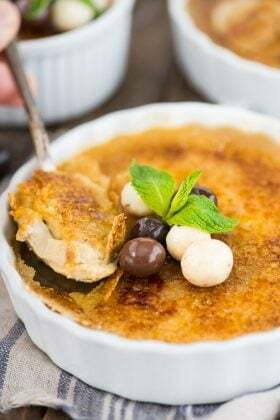 1 cup granulated sugar + 1 Tablespoon molasses = 1 cup light brown sugar. For dark brown sugar, add 2 Tablespoons molasses instead of 1. If you want to end up with a brown sugar like it comes in a package, combine the sugar with the molasses by hand or in a small food processor. In a recipe, like this one, where it is an ingredient, add the granulated sugar and molasses separately. They don’t need to be combined. 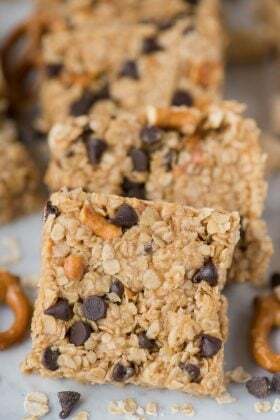 For this recipe, 3/4 cup brown sugar = 3/4 cup granulated sugar and 3/4 Tablespoon molasses (or 2 1/4 teaspoons). Using molasses in a cookie recipe makes the cookie softer and chewier, especially in a chocolate chip cookie. I can’t wait to make some. 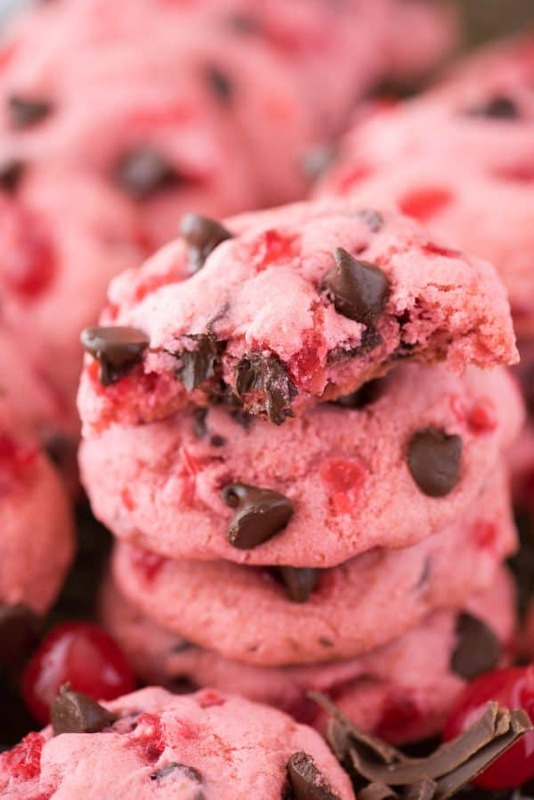 I make a cherry chocolate cookies that sounds kind of similar to these but they use some cherry juice in it and instead of chocolate chips it calls for a Hershey kiss to be pressed into the center of the cookies when they first come out of the oven. Hi Jackie – it will change the texture and structure of the cookie! What is the yield for this recipe? I teach 7th grade culinary arts and I am thinking of trying this recipe with my students. Oh yes! I had red fingers for a day!! very disappointed. 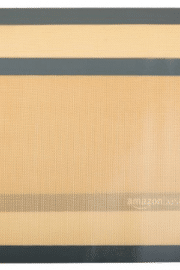 says we can print this off but this will not print. I can not keep going back and forth from my phone to make it and the computer is downstairs. I want a printable copy to be able to use. Can you substitute the butter with coconut oil? If so, is it a 1 to 1 ratio? I haven’t tried it yet, report back if you do! If I don’t have a silicone pan. Should I use a dark or light surface for pan? Either is fine! I have both. I used the exact ingredients but my cookies turned out too cakey. I think it needs more butter? The flavor is lacking too. I even used real vanilla and almond extract. Loved your cookies! Is there a way to make this recipe into cupcakes? What kind of icing would you use? Beth, These would make great Christmas Cookies, by using Mint & maybe white Chocolate Chips. For someone who is allergic to & to avoid Artifical Colorings, Artificial Preservatives & Artificial Flavors, could you use another jar of cherrys & boil them & maybe add sugar, in order to get the color? If so, how much? What am I doing wrong? Tried making twice now. Both times the cookies instantly melt in the pan and becomes one thin burnt mess. Please Help!! Really want to make these. Oh Dawn.. that doesn’t sound good! Can you give me more feedback – did you follow the recipe as written? Thank you for this recipe! I tried 2 new recipes for the holidays so far this year and both were terrible. I have been thinking about this recipe forever and went for it! So glad I did- these are amazing! I did make them a bit smaller, did not garnish, and only baked 10-12 minutes- also increased the almond extract a touch- simply DIVINE! 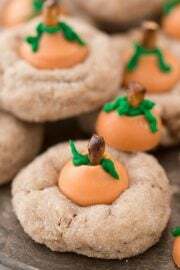 Perfect on the christmas cookie trays! I am making this cookie today and plan to freeze for just one week. I also am going to use white and chocolate chips, and double the batch. Can’t wait to taste! YES! We love King Arthur Gluten Free Measure for Measure Flour. Use it as a one for one substitute. I made these for a cookie exchange at work and they were a huge hit!! So moist and flavorful!! This one is a keeper! I did a cherry cookie taste test for a Christmas cookie tray dry-run. My only complaint with following the recipe was that there just wasn’t enough cherry flavor in the cookie. My final batch has been getting rave reviews and the tweaks I made were to use 1 tsp cherry extract, sub vanilla for the almond extract and I used a whole 16 oz. jar of cherries. That gave the dough the cherry flavor I was looking for. Hi! I just making these. Taste great, but hardly spread at all. They don’t look like the picture. The dough was very dry. Hard to fold in chocolate chips and cherries. Doubled the recipe. Could be part of the problem. Do you sift the flour? Thank you in advance for any advice. Hi Rob! No I don’t sift the flour. Did you measure the flour properly? The proper way to measure flour is to use a spoon to spoon the flour into the measuring cup. Do not pack the flour and do not stick the measuring cup into the bag to scoop the flour. Then use a butter knife to level out the top. I made these as directed and they turned out perfectly. Thanks for sharing this recipe! These came out yummy and so pretty, but I would like a bit more cherry flavor next time. 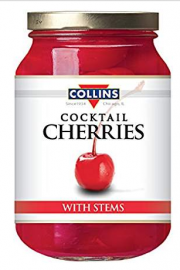 Might try cherry extract though….cherry juice from the jar of cherries didn’t do quite enough. Well I loved this recipe and hardly say much because I never use a recipe exactly the way it was but I make cookies and cheesecakes for all over town and just randomly make them for different people. I did several batches before my final and the first I literally used a cheese cloth to dry them once chopped and yeah it was pretty dry but you could fold them together and form a cookie but they still tasted great..
2nd batch I left the cherries a little more damp which helped a lot..
My final I did 4 times the recipe (said I make them for a lot of people lol) which would of been 2 sticks of butter (1/2 for each batch) well I did add another 2 sticks which would of changed it to 1 stick per batch. I also used 1 1/2 tsp baking powder instead of 1/2 tsp baking soda per batch (so in my case 6 tsp baking powder) just a personal preference I’ve had too many people enjoy my regular soft batch chocolate chip cookies better or at least the texture. Today is 2/14/19 and we delivered cookies to several companies and aboout 10 individual people and all of them were blown away… Couldn’t of done it without this Beth thanks for the recipe and I’ve used several of yours thanks again. I’m so glad that you found what worked best for you & that they came out well! Beth, these cookies looks amazing! I can’t wait to make it! Beth, it’s awesome! I cannot wait to try this. I bet it makes the house smell divine and tastes incredible! YES! Let me know if you try it out! Beth, nice idea! This cookies look absolutely delicious! I need to try it! Thank you! & yes! Let me know if you try them out! I’m so glad it came out well for you! Beth, this looks incredible and insanely delicious! I’ll definitely make it next time I host a party! Thank you so much, Ellery! & YAY!! Let me know how it goes! What do you think about changing the food coloring to green and adding chopped pistachio nuts. Then you would have a spumoni cookie! YUM!!! I like that idea! I made this recipe tonight and I follwed it exactly, but none of it looked like the pictures or video you have posted. I used pink gel food coloring and could not get that vibrant pink color you have. 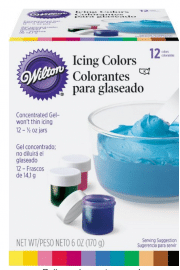 Can you please share the brand of food coloring you used? Also, my dough was extremely sticky and I couldn’t even roll it into balls. I want to try this again. Any suggestions on whst I could do differently? Beth, this was wonderful! Never knew that those flavors would come out as they did in this beautiful dish! Follow the recipe word for word!!! Beth, thank you for sharing this! I have made this so many times. Everyone that tries it, loves it! YAY! That makes me so glad!